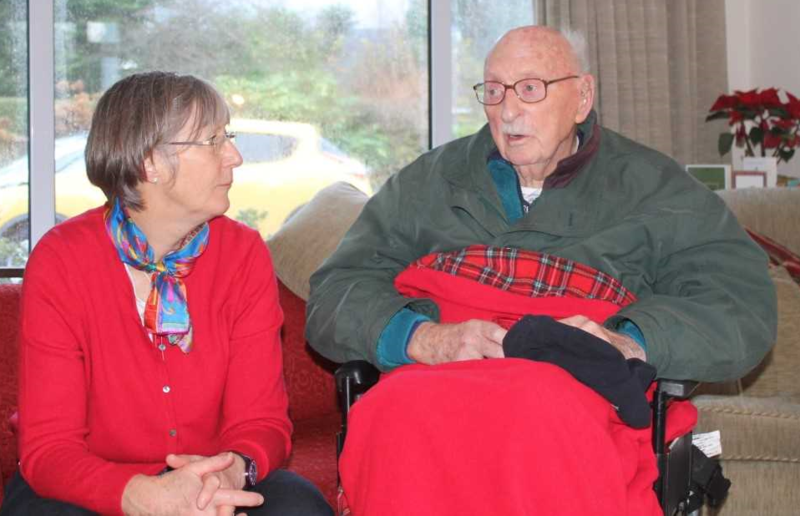 A RETIRED County Down GP, who attended Bangor Grammar School for seven years in the 1930s, celebrated his 100th birthday on Sunday 6 January. Not only is Dr Jim Gibson, who resides in Newcastle (and is pictured here with his daughter Avril), the school’s oldest known living past pupil, it is also believed he is the first person associated with BGS, whether as a pupil or a teacher, to reach his century. On hand to celebrate his birthday were sons John and Brian and daughter Avril, daughters-in-law Trish and Barbara, grandchildren Cathy, Joanne, Clare, David, James, Patrick and Katie, as well as a number of Dr Gibson’s great grandchildren. Born in Newcastle on 6 January 1919, Jim Gibson was the son of a Moneyslane farmer who moved to Bangor in 1930 because at the time there was no grammar school in the immediate area (Down High School would open its doors in Downpatrick three years later). The Gibsons lived at ‘Sandown’ on the town’s Groomsport Road. He was predeceased by a brother and a sister, who both died when they were children. Dr Gibson’s connection to Bangor and the school emerged in 2013 when Bangor-born journalist Terence Bowman -current chairman of the Grammarians – was giving a talk to the Donard (Newcastle) Probus Club about several of his recent publications about Bangor. Afterwards Dr Gibson, by then in his early 90s, pointed out that he too had lived in Bangor in his younger days and – like Terence – had attended Bangor Grammar School for seven years. Arising from that relatively brief conversation, Dr Gibson, accompanied by his son Brian (a former Bangor RFC player), was delighted to visit the school’s new £20m-plus Gransha Road campus in December 2013. The ‘newly discovered’ past pupil was accorded a warm welcome by soon-to-retire Headmaster Stephen Connolly. 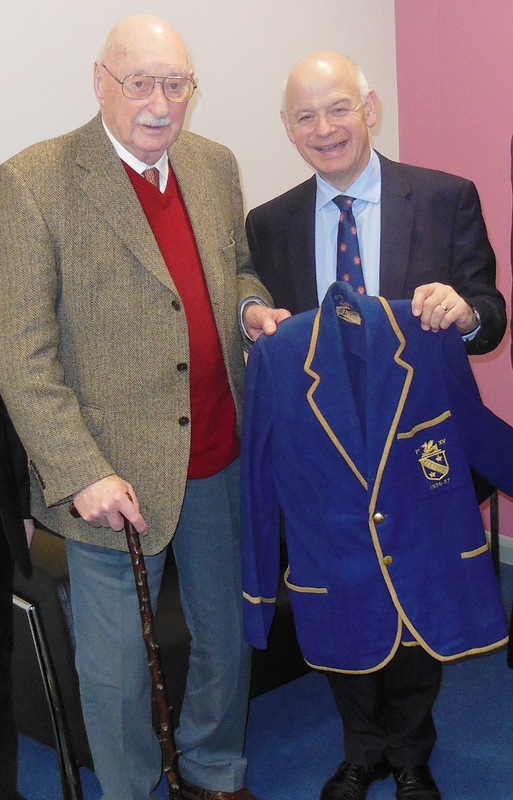 A former member of the school’s 1st XV rugby team, Dr Gibson took great pleasure in presenting his original Colours blazer from the 1936/37 academic year to Mr Connolly and School Archivist Barry Greenaway. 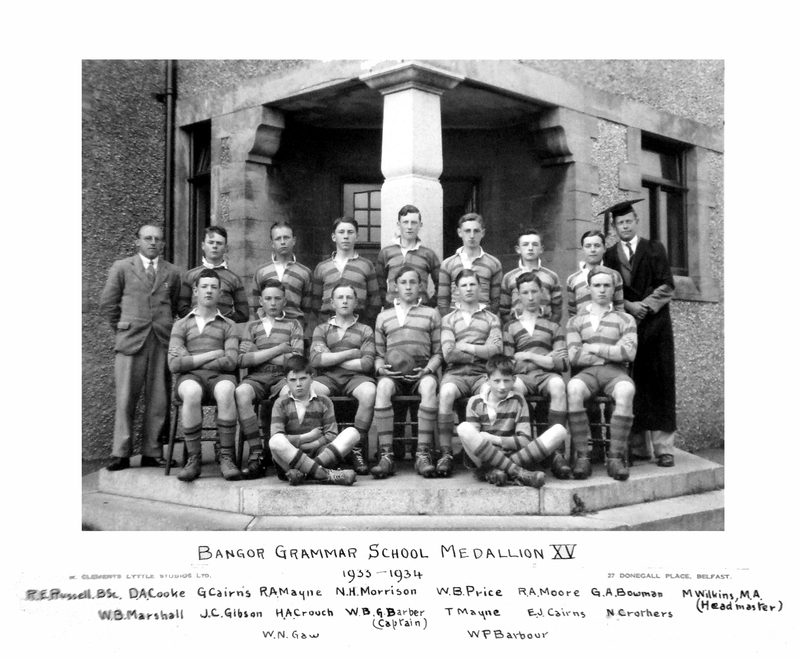 A contemporary photograph from 1933/34, produced by Mr Greenaway, showed that Jim had also played for the Medallion XV, and that he and Geoffrey Bowman – Terence’s uncle, an RAF pilot who was killed during the Second World War – were on that same team. Dr Gibson was also reunited, for the first time in 76 years, with former classmate Godfrey Lindsay, who until then was understood to be the oldest former pupil of the school; in fact it emerged that Jim was his senior by some 18 months. Although they hadn’t seen each other since 1937, when they both left the school, they were soon chatting about life in the seaside town before the outbreak of the Second World War in September 1939. They also shared poignant memories of other former pupils who died in the conflict. After completing his education in Bangor the young Jim attended the College of Surgeons in Dublin, where he qualified as a doctor. Following short spells in Londonderry and Holywood, he returned to his native Newcastle – before the creation of the National Health Service – going on to become a popular family doctor in the town. He retired in early 1984 at the age of 65, but maintained a busy out-of-doors life which included fishing and sailing, as well as a great love for clock restoration. He was one of a small local team who ensured the station building clock at Railway Street, Newcastle, always kept accurate time. 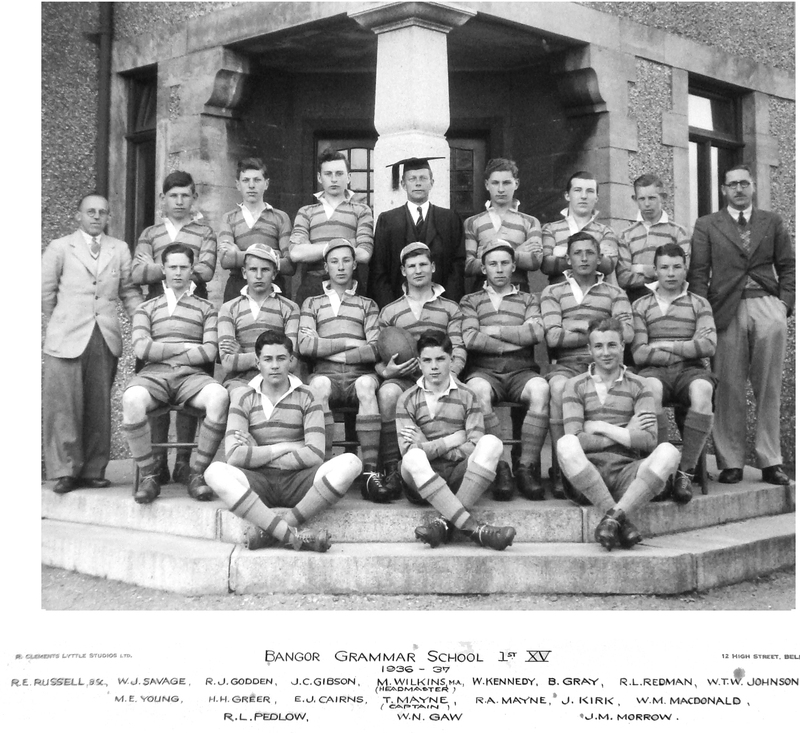 •	Anyone with information about any other Bangor Grammar School centenarians (of the past or present) is invited to contact Terence Bowman by email – the address is grammarians@btconnect.com.